A few weeks ago at the all-county Men’s Retreat I realized just how ridiculous I sound at times. Or how ridiculous my expectations are. The first night set the tempo for the weekend. Joe Bishop shared out of Matthew 11 and introduced the theme for the weekend, finding rest in Christ and releasing our burdens to him. After his talk we took a few minutes to share with a couple guys one or two burdens that we are carrying through life right now. When it was my turn, I shared that my mom had passed away about a month prior, and I kinda feel like I should be over it and moving on with life now. But the reality is I’m still struggling. Wait…did I really just say that? It’s been a month…get over it? The truth is that’s how I feel, but I would never expect someone else to feel that way if I heard them say it! Last night I had one of those nights. I sat on the couch and just wept with my wife. The kind of weeping where your whole body convulses with each cry. It’s happened 3 or 4 times since mom passed. Just admitting that publicly is super tough for me. I hate admitting that I cry almost as much as I hate actually doing it, both of which are more comfortable than actually being caught in the act. Not sure how I got that way, if it’s the guy thing or what, but it is. I realize more and more that I don’t get this whole grief thing. I don’t know how to do it correctly. If there even is a correctly. I thought I’d have it wired after experiencing the loss of my father at 16. This is completely different. I don’t know how to allow myself to mourn and just let go, so instead I end up taking it out as frustration at my family. Not fair at all. Recently I started meeting monthly with a spiritual director. We talked about all this and he encouraged me to stop thinking about doing it correctly and just let it happen. One thing he strongly encouraged was caring for my own soul by doing some reading about grief. He suggested some books, one that stuck out to me being A Grief Observed by C.S. Lewis. But I have a list of more important books to read. You know, ministry books and stuff. Besides, do I really need a book to help me grieve my mother? OK, well, I guess it couldn’t hurt. After doing some looking on the web this morning I decided to take him up on the suggestion and went with In Memorium by Henri Nouwen. 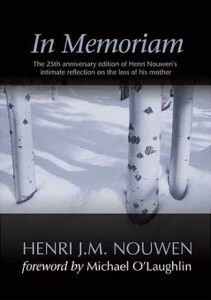 I really dig Nouwen, and the book is his own reflections on the loss of his own mother. It’s going on the Kindle App on my iPod touch now. I’ll add it to the list of books I feel the need to read right now. But maybe I should bump it to the top. Perhaps I’ll share some reflections as I process the book. In the meantime, I’m bringing it to Jesus, including my questions and struggles, and doing my best to grieve well. Just a quick, honest snapshot into the current state of my soul. Part of it anyway. Everyone mourns in different ways, some people bottle it up and never truly deal with their loss. There is nothing wrong with letting it out, this is a significant loss in your life. I’m very blessed to have my mom and the older she gets the more I think ‘how will I handle it when she’s gone?’. Reading books to help is great, seeing a therapist or a coach is good as well, but like you said, with all that you also need to go to the ‘top’ to our Father who is also waiting to comfort and console you as only He can. As believers we have Him to rest on, to lean on and into. His Word is at our fingertips to bring us comfort, His love is always ready and waiting to wrap us tightly and let us know that He is there. I pray that you continue to find ways to mourn, to remember her, but never feel ashamed of grieving that loss. I’m in for reading C.S. Lewis’ book. Or even Nouwen. We’re praying for you Bobby. There is nothing wrong with taking time to mourn. Thanks Sara! We miss you guys too. We’re ready for you to move north. Jamie-I figured you would understand at least a bit. Maybe you should start reading it and my blog can be our virtual book club! Anyone else? Blessed are those who mourn, for they shall be comforted. -Matthew 5:4. By the way- that book is on my reading list as well. Bobby thanks for your honesty!!! I find if I keep things bottled up I get sick!! Physically, mentally and spiritually. I think I don’t want to burden people with my junk! Speaking from 50 + years of experience- that is not good. I don’t care if you are man, woman, child or animal- we all need to let it out!!! It is a cleansing of sorts to cry and cry hard!!! It reminds me of a heavy rain and after the rain the wind comes to dry up the rain, the clouds part and the sun comes out!!! The sun will shine again and we even get to see rainbows, which reminds us of the things we have mourned and God lives on!!! He lives on through you and all you do to honor Him. So go out and buy a big box of tissues and cry on!!! We love you and miss you and your amazing family!! !